Giving things up sounds like such miserable, hair shirt stuff, but even the thought of writing this article makes me happy. Somehow downsizing my life so that I can achieve my life goals isn’t much of a sacrifice at all. In fact, it’s liberated me. Granted I’ve had some practice in this area over the last year or two and gone to extremes that some people couldn’t. Here’s the story. In 2007 my husband and I sold our lovely home on beautiful Waiheke Island, New Zealand, in order to finance a trip to Central America. We got rid of most of our other belongings too and broke our kids’ little hearts by selling, giving away or simply binning most of their toys. The Candy kids were just two, five and eight at the time, so they got over it. We did put some personal stuff like photos, baby books and a few favourite toys, into storage in New Zealand, but during our time in Central America and Costa Rica, where we lived for a year, we had very little compared to what we had in New Zealand. Although we ended up spending 18 months in Central America, there wasn’t much we missed in the way of creature comforts apart from a comfy sofa. Books and clothes came to us by swapping, borrowing or second hand. We had minimal furniture and our walls were bare but there was plenty to entertain us. Every house we lived in had spectacular views and a swimming pool. Toucans visited our garden daily, occasionally monkeys or coatis popped by and a plethora of amazing outsized insects diverted us on a regular basis. Now we live in Queensland, Australia and I’m pursuing writing full-time. I’m more or less resigned to a life of less since writing isn’t usually well paid, but somehow that doesn’t bother me any more. I’d prefer to be happy and fulfilled than have all the mod cons some people work long hours for, often in jobs they don’t even enjoy. We’re blessed to live in a good house in a gorgeous area, surrounded by clean, safe beaches and with plenty of free activities on tap to keep us busy. But we’ve definitely made sacrifices and will continue to do so happily ~ unless an unexpected and extremely large windfall comes our way in which case we’d probably get rid of everything again and spend a year in Africa. Thanks for reading, please add your comments below. And remember to subscribe by email or to the RSS Feed so you don’t miss out. I have a neighbor who would love to do what you have done. But I’m not sure what she would sacrifice for it. I’m impressed. It’s quite a change you’ve made. Sounds like a good one, though. I wish you well with your new writing career. Tough it out, and I bet you’ll do very well. What an incredible inspiration! My boyfriend & I did the whole “sell everything & travel around the world”, but I imagine it’s a different story with three children!! It’s not about giving things up, it’s prioritizing what’s really important to you based on YOUR definition of success. If that is writing & travel & less mod con- so be it. Love the message. Lovely post and kind of post I need always :) After ending first level of school I also plan to travel more. I want find best teachers in the world and the most intersting people in world and learn from them. For long time I try to get rid of everthing which I really don’t need becuase on the most things just don’t matter, some or just very useful. this really sounds great. I love you for sharing! I love the article on walking! Why, just two minutes prior to reading this I was whining to my husband for taking the car all day and leaving me at home without letting me get my workout in at the gym this morning. I felt trapped and frustrated. How silly – I live deep in the jungle with plenty of roads and trails to explore and I’m also at the base of a hill that I can get a good workout in on. Well my little motivator – you got me! I’m up and out of this chair and am on the first of many early morning “hikes” not walks! teehee! Hi! are you already member of HUB: Humanità unites Brilliance? you can go to http://www.givewhileyoureceive.com/sarabass and you will find what this is: it could interest you!!! Bye and thanks for the joyful articles!! What an inspiration you are! I admire you for having the guts to do it even with your young children – what a gift you gave them! I moved around quite a bit in my life, even changing continents. Every time I got rid of a bit more ‘stuff’. I am now at the point you were before you moved to Central America – selling everything and become a serious traveler. Just discovered your blog today. Really enjoy your writing. As a side note, my blog spiritnewsdaily.com aggregates spiritual news from around the world. If you have a guest post that fits with the format, would be more than happy to link back to you. My alexa rank is 260,000, not quite as good as your 218K, but close. 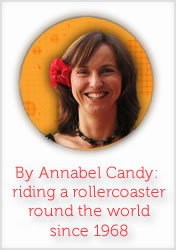 Thanks Annabel, you have really give me a push to make me step forward and say I want to live my dream! Yes, my husband and I are making a big decision and action had been carried out, but sometime the final decision is not us to make, we have to wait for the results… and still waiting with high hopes .. that we could live our dream one day in OZ. These few days, I have been reading your post from older post to new post… and I love them all. And have to say THANK YOU! Thanks for sharing that. It’s always good to be reminded that when we die we can’t take with us any ‘stuff’ just our experiences. Living in Brazil for a year I saw people living in poverty stricken conditions that had a happier life than some Australians filling their houses and their lives with ‘stuff’ to make them happy. I consider, people like you Annabel, my heroes;) and I would love to do the same. I’ve been thinking about it for last 2 months I guess. Right now just searching for inspiration. I’m sure you are happy now and you know you made the right choice. Love it. Really interesting, I’m linking to it in my next post Have Less Love More. I’m glad to have found your blog, all the best! If I had poked my head out of my own life a few years ago, I would have had a timely comment for this wonderful post. I am soooooo with you. My husband and I took off on a life of full-time travel at a time when all our friends were advancing to the highest heights of their careers, padding enormous retirement accounts and planning luxurious retirements. Since we started, we’ve revised our dreams several times, embarking on a voyage by sailboat for 3 years and now contemplating closing that chapter so we can open one that might include RVing in Australia or Europe (maybe we’ll meet someday!). I wrote a post about why it was important to us to pursue our dreams back in 2008 written long before my move to WordPress and my discovery that what I was doing all the time on my “website” was “blogging”). “Less is More” It sounds so counter-intuitive, yet is so true. Of course, it is easier to travel from a rich country to a poor country. Not so easy the other way around. The skills acquired in accumulating wealth are always at the fore, and instead of purchasing stuff, one purchases experience. It’s not quite a ‘give more than you take’ model. To simplify, like Thoreau did, does not require going somewhere new. Very inspiring story indeed! Great to know you finally settled in Australia and you’re now pursuing what really makes you happy. Next post: Have You Ever Slept in a World Heritage Building?